Optimistic people are fun people to be around. I know this from years of experience being around both optimists and self-deprecating pessimists. Optimistic people are the kind of people who have experienced pain and suffering and loss, but who haven't let it color their perception of the world. Pessimistic and self-deprecating people, on the other hand, have seen the darkest parts of humanity (including themselves) and choose to view the world as such. They see the dangers in people before they see the positive attributes they possess. Optimistic people, conversely, see the light and the goodness and the humanity in others and often don't see the dangers in trusting those people until it's too late. What I think is so interesting is that "Flash vs. Arrow" allowed us to explore two very different types of heroes: the ones who continue to see light and the ones who believe they are too far gone to harness much of that light any longer. I love themes (I have a Bachelor's in Creative Writing, after all. Sue me.) I love that The Flash and Arrow are two series that explore grand ideas, not just of heroism but of humanity: What does it mean to be good? What does it mean to hope? What does it mean to forgive others and forgive yourself? What does it look like to question your own identity? That last one is actually a pretty heavy theme in both Arrow and The Flash this year, though the latter to a lesser extent. Oliver Queen is spending the third season trying to figure out if he is Oliver or if he is The Arrow and whether or not that is something he can choose or something that is chosen FOR him. Barry, meanwhile, is still exploring the theme of identity: he's still trying to wrestle with the belief that he was chosen to be a hero. Oliver was fashioned into a killer, who then molded himself (with the help of Diggle and Felicity) into a hero. Barry... well, Barry experienced none of that. Barry woke up, literally, as a hero. And that's startling to him, as it should be. And what's so interesting about "Flash vs. Arrow" is that the conceit seemingly pits The Flash and The Arrow against one another, but what it really does is pit Barry Allen against Oliver Queen. So, if you'll allow me to, I'm going to take this opportunity to dissect all that I loved about "Flash vs. Arrow," while also exploring themes and character development. And lucky you -- I'll be back tomorrow night when the crossover concludes to talk about Arrow's "The Brave and the Bold" as well! Barry Allen is an optimist. He's the kind of person who thrives on energy and light and goodness and hope. He's persistent to the point of adorableness, really. And like an energetic puppy, Barry is always willing to keep trying and keep fighting and it's HOPE above all else (and the promise of justice and bringing goodness to the world and to his city) that drives him. Oliver Queen is nothing like Barry Allen. I've realized this, having marathoned Arrow the summer before The Flash premiered. Barry smiles and jokes. His team nicknames their foes. He babbles and laughs. Even in extremely tense situations and moments, Barry always has a certain persona around him -- he's always fighting because he still believes he is good. He doesn't know yet if he believes that he is CHOSEN, but he believes he is special. And he believes that he can help make his city better because of that fact. Oliver Queen is a pessimist and he's self-deprecating. Oliver went through five years of hell (as he tells us in his voiceovers), but that doesn't mean that hell ended when his return to Starling City began. No, Oliver is plagued. I think that's the best way to describe him, really: he's plagued by not just the darkness he has seen but by the darkness that he has done and has been done to him. It's easy for Oliver to blame himself for things -- as he does quite frequently -- because he believes he deserves the blame. It's the self-deprecating part of his personality: he punishes himself because he believes all he has done to other people demands punishment. So Oliver doesn't smile a lot. He doesn't joke. He doesn't even really believe he's a hero. He believe he has a purpose, sure, but even that purpose is shrouded in darkness. Isn't it rather telling and striking how dark Arrow is and how light The Flash is (that applies both literally and also thematically)? Team Flash is surrounded by windows where light pools in, whether natural or florescent. In the dark lair of the Arrow cave (where we are literally underground, mind you), there is no natural light to be found and I think that's significant. It doesn't just impact mood, but it reflects Oliver's personality and his conflicting desires to be both in the foundry and outside of the foundry. He doesn't want to die down there, as he expressed to Diggle in "Sara," but he also doesn't feel like he has a choice in the matter. And even with the little bit of light in the room, Oliver still feels hopeless. Enter: Felicity. This is a woman who is an optimist -- she brings hope and joy and laughter to a place that was dark; she brings warmth into a place that was cold, both literally and metaphorically. Felicity entered the foundry and she changed Oliver's life, whether or not he knew it. Suddenly the cave began to get a bit brighter and more lively. By the beginning of season three, Felicity was LITERALLY bringing life into the foundry in the form of a fern. And Felicity (whose name actually means "light," for all of you out there who were unaware of that fact and importance) really fits in well with Team Flash. Why? Because she's LITERALLY SHROUDED IN LIGHT. ALL. THE. TIME. Oliver and Barry are different. We've already established this of course, but it's important to know exactly how their differences impact them and their respective teams in "Flash vs. Arrow." There is a villain running around Central City in the episode and this villain -- this metahuman -- attacks others by manipulating their brain chemistry and emotions. The thing about feelings and emotions as Barry says at the beginning of the episode is that everyone has them and everyone feels like they are unique in having them. But our emotions are not unique, really. We've all experienced love and loss to varying degrees. We think that when we get our hearts broken, we are the first to ever feel that way -- or, at the very least, that no one has ever felt the way we have on the level that we have. Barry is an emotional human being and he does what all optimistic people do. He hides behind his facades and his jokes and his dazzling smiles because the way that optimists stay optimistic is by pushing away or burying those things that would otherwise make them pessimists. Barry is also going through a bit of an identity crisis, but one very much unlike Oliver's. You see, while Oliver tries to separate himself (the person) from himself (the hero/vigilante), Barry doesn't want to do that. At all. He believes that his powers make him who he is. Remember when he lost them, last week? Do you remember the conversation he had with Caitlin? The only time that Barry feels whole is when he is running as The Flash. When he strips that part of himself away... well, he becomes just Barry. And he doesn't like "just Barry" -- this forensic scientist who is ordinary and who never gets the girl. Throughout the episode, we see Barry bury his emotions and his anger and bitterness behind his suit and his speed and his smile. Oliver Queen, remember, has been doing this superhero thing for a lot longer than Barry has. But when Oliver looks at Barry, he doesn't see a nuisance. He doesn't even see a man or a child. He sees everything he could have been if it hadn't been for the island and Tommy and Moira and Shado and Slade and Sara and all the pain he endured because of it. He sees someone who was CHOSEN to become a hero, not someone who was forced into it by being forged by fire and darkness. He sees someone who has what he cannot -- who can help people because others trust him, rely on him, and because he can bring hope to the hopeless. And when Barry (partially under the influence of the metahuman) spits at Oliver, accusing him of jealousy, there's a part of Barry's rage-induced tirade that rings true. You see, Oliver wishes he could be like Barry. He wishes he could be young again, to not be jaded by the things he has seen... to have his life ahead of him without mistakes looming over his head like a storm cloud. (It's like Barry is Roo and Oliver is Eeyore, really.) What would Oliver give, do you think, to undo the darkness that brought him back to Starling City? But there is one reason that Oliver can be trusted, even if his methods are unorthodox and even if he has killed in the past to get justice: he genuinely cares about Barry and -- most importantly -- continues to believe in him. Where Barry's youth may cause him to become hot-headed and jealous and resentful, Oliver's life experience and age and circumstances have taught him that in order to survive, he NEEDS hope. He needs to keep learning. He needs to surround himself with people who challenge him and he needs to take every opportunity possible to remind Barry that he is special and that he is a hero for a reason. Oliver, at this point, is the only person in Barry's life (save for Caitlin, perhaps) who has expressed the fact that the lightning bolt chose Barry for a reason. It marked him for a purpose. BARRY doesn't even believe that about himself. And in order to keep being the hero that Central City needs -- the hero that Oliver can never be -- Barry needs to be constantly reminded that he instills hope in people and goodness and that those things are the mark of a hero, not his super speed. I love the relationship between Oliver and Barry and I love that "Flash vs. Arrow" explored their dynamic and allowed them to clash. These two heroes are not similar in their beliefs or methods, really. Barry is impulsive and puppy-like; Oliver is cautious and guarded. But both men have grown as individuals through the relationships with each other and their respective teams. You can see in this episode how much Team Flash cares about Barry. They look out for him, even if they (see: Joe and Harrison) are wrong about others. Cisco and Caitlin protect not just Barry in the episode, but protect and help Felicity. And Team Arrow? Well, we see quite clearly how much Felicity and Dig want to protect Oliver (and also Team Flash) and how much Team Flash protects Oliver (by not telling others about his secret identity). Being a part of a team or a family doesn't mean that you agree all the time. Oliver and Barry don't often see eye-to-eye given their stubborn natures. Being family means, though, that you would do just about anything to remind the person you care about who they truly are. That is what Oliver does for Barry, even when it is heartbreaking to do. At the episode's end, Oliver and Barry look at Felicity and Iris, and Oliver says: "Guys like us don't get the girl." It's this beautifully heartbreaking moment because it's the only time in the entire episode in which Oliver and Barry are on equal footing -- they both know what it is like to pine and to want and to ultimately lose the woman you love because of the life you chose. And they will never be more connected than they are in that moment. Heroes look different to each of us, but I think that's the point of the episode, really. "Flash vs. Arrow" set out to pit one superhero against another. Who is better? Well, honestly, I think the true answer is neither and both. A hero is whatever you most desperately need in your darkest hour. A hero is a person who rescues you when you didn't know you needed to be rescued. Barry is a hero. Oliver is a hero. And though they are vastly different, they are both important. Darkness wouldn't exist without light; a world with only pessimists would be dreadful and a world with only optimists would be naive and maddening. Thankfully, we live in a world where an arrow and a flash can both save us. And aren't you glad for that? I really need Arrow and The Flash to be combined into one big super-show. I would watch the heck out of that, y'all. As it is, I really loved the first part of the crossover event and I cannot wait for more tomorrow night! Reading everyone's articles that praised David Ramsey for Dig's reaction to Barry made it seem like it was being over-sold to me, but IT WAS NOT. I think that is the most hilarious thing David has ever done with his character and face. Ever. "I have a cousin who got hit by lightning once. He just developed a stutter." "Cooooooooool. ... I mean... awful." "We looked down that road and we said no thank you." God bless Felicity Meghan Smoak. Danielle Panabaker running and screaming after being chased by the boomerang was hysterical, I cannot lie. Oliver and Felicity casually sipping coffee all relaxed and whatnot made me squee. Can I admit that? They were essentially being a married couple. And, as Deb pointed out on Twitter, Felicity used the equivalent of Annie Edison's doe eyes to get Oliver to do what she wanted him to. Oliver Queen is on everyone's lists, Iris. ERRRRRYONE. "YOU SHOT ME?!" "I heard you heal fast." Dear every other show on television: take notes from Team The Flash and Team Arrow. When two intelligent women like Caitlin Snow and Felicity Smoak meet, there is no need or room for cattiness. Write your smart women like smart women and have them bond over being women and their collective intelligence like Caitlin and Felicity did in this episode. Oh, also, can we have a spin-off of just them solving crimes while wearing fashionable dresses and heels? Okay. "Since when do we have facial recognition software?" "Happy Hanukkah!" "It's practically impossible to tell when Oliver's making a joke." "BLAH BLAH BLAH, no prison can hold me... I've heard it all before." "There is something off about that guy." It literally took Oliver an episode to notice this so WHY HASN'T ANYONE ELSE? Well, if you didn't call the twist at the end of the episode (both Ronnie and Oliver's baby mama), I'm sorry? I saw that coming as soon as they announced there would be a "big twist" for Oliver. And while I hate when shows develop something only to drop it later... I kind of want them to drop that particular story for now. There's far too much going on in the Arrow-verse as is. I didn't even hit on the optimism/pessimism dichotomy in my post, but it's so right there and so clear! "He needs to surround himself with people who challenge him" THIS is why he picked Diggle in the first place. It was when Diggle outsmarted him and sat in the backseat of the car in the pilot that Oliver knew that this was someone he could trust and someone who could challenge him. Oliver, as we've seen with pre-island Oliver, isn't the sharpest tool in the shed, but he's been surrounding himself (either on purpose or by circumstance) with people smarter and better than he is, which has made him smarter and better in the end. I mean, even his relationship with Laurel was an early taste of Oliver's need to be around people who challenge him (though her challenges are something to be desired at times). I really hope in the next one, Barry says something that gets Oliver to change his approach with Felicity. Obv this was Barry's episode so he learned all the lessons, but that last one hurts so much, for so many obvious reasons. But the thing that hit me most today is "how do you know guys like you don't get the girl, Oliver? You've never even had her." He's never even tried. He's just taking it as fact that he won't get her. So hopefully in his episode, this is the lesson he will learn by the end. Because Barry's a good person to impart that lesson. Partially because of what you said, about them being on equal ground, but also because he knows Felicity and because he's an optimist as you said. He may now be on rough terms with Iris, but his natural optimism won't get him down for too long. Something fun I noticed in this episode: Barry makes Oliver smile more in the suit than any other character, Felicity included. This is so cute. Oliver's smiles are so much wider and he's less afraid to show those smiles. I think part of it, as you hit upon, his desire to make sure Barry knows he believes in him. Also, he can show emotion for Barry around others because Barry can protect himself. If he shows emotions for other people, enemies will know his weaknesses and they can't protect themselves the way Barry can. There's also something to be said about Felicity and Barry sharing so many personality traits/quirks so they both incite the same feelings in Oliver but with Felicity, because of his thoughts on superheroes' abilities to be in relationships, dials it back a bit, but she forces the smile out of him, while he doesn't have those reservations about Barry so he allows the smiles to come. 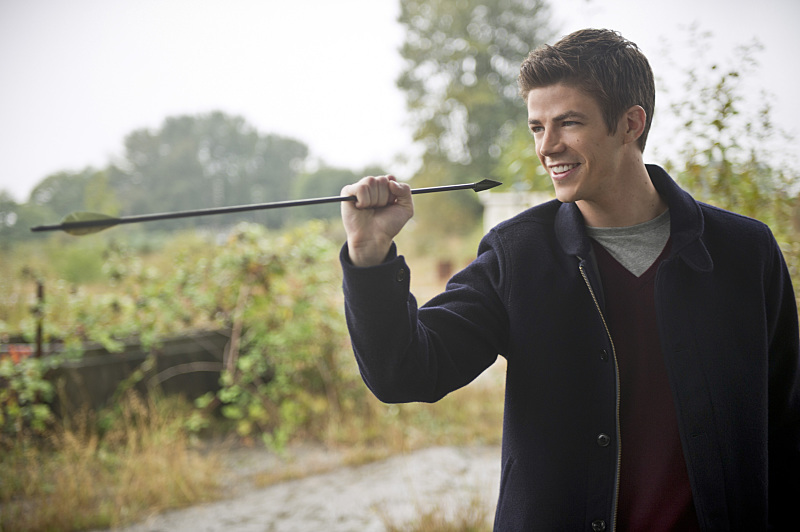 I think that the wide smiles Barry gets will be the ones Felicity gets when they eventually get their act together. He won't hold back, even in the suit. "A hero is whatever you most desperately need in your darkest hour. A hero is a person who rescues you when you didn't know you needed to be rescued. Barry is a hero. Oliver is a hero." They're each other's heroes. I can't wait to see how Barry saves Oliver tomorrow. Oliver and Felicity were SO married in this episode. The way she translated his words at the end was SUCH a wife move. Does Diggle not like coffee? They constantly went to Jitters without him (which we've seen is often a date spot........). Also married was the way she asked, "who was that?" at the end. CONNIE YOUR COMMENTS ALWAYS GIVE ME LIFE. Thank you for being so dedicated that you write your own posts AND comment on these ones. I seriously appreciate it. 1) The optimism vs. pessimism dichotomy was my first thought immediately whenever Barry and Oliver share the screen. He's like a little puppy and Oliver is like the grumpy old man. 2) YES. Oliver has surrounded himself with people who aren't afraid to tell him no -- who aren't afraid to stand up to him in order to make him better. And Oliver (as he said in this episode) is so completely stubborn that he needs that; he needs people to fight with him on things and I'm so glad Team Arrow is that for him. 3) Um, you're brilliant with your analysis of that final Barry/Oliver moment. HE NEVER EVEN HAD FELICITY, SO HOW DOES HE KNOW? And I seriously need Barry to talk to Oliver about his feelings in this Arrow episode (I really think it'll happen). And Barry is the kind of person who Oliver needs to hear that from -- he knows Felicity and her personality so well. Also, apparently it'll be made clear in this episode (via some people who've already seen it) that Oliver lets on that he knows about Felicity's kiss with Ray. I did think they were super chummy in this episode of The Flash, though, so I'm interested to see if their dynamic continues in Arrow's episode tonight. 4) I LOVE HOW MUCH BARRY MAKES OLIVER SMILE. They need each other. They really do. Because they make each other better heroes. And even though they're stubborn and stuck in their ways a bit (and both can be a bit show-off-y), they really do bring out the best in one another when they're on the top of their games. THEY ARE EACH OTHERS' HEROES. 5) Oliver and Felicity were such a married couple, seriously. I think Dig was probably back at his hotel in Central City just constantly thinking of questions to ask Barry about his super speed, LOL. Regarding that bit at the end, I've pretty much known since SDCC and Stephen kept saying "I have this great idea for central city..." OR "i have a great idea how to get the baby mama back in" he'd never say them together, but once you heard them both you knew lol And I think that this was a mere acknowledgment of her existence in not a flashback. I don't think the kid is going to come up soon, I certainly agree they have enough on their plates and think that this is why they did it on the Flash and not on Arrow (aside from the simplest reason they did it in the first place: she said she moved to Central City and they're in Central City). I wasn't expecting Oliver to actually meet her, I figured she'd be in the background somewhere or she'd know Iris or something. I wasn't expecting a direct meeting, but again, I think that they've put it out there and we know she exists. I'd love it, actually, if they had her meet the Flash team a few times in different circumstances (Barry saves her kid, doesn't remember her since he doesn't really see her here) before the kid is ever important to Oliver. The kid is definitely a season 4/5 move... But i like that they included her, so that there's stronger recognition for her when she appears later down the road. Omg the episode was AMAZINNGGG and I canNOT wait for tomorrow's episode of Arrow. More epic-ly long comments then! Yay! Yeah, I'm not a huge fan of a baby mama story anytime soon so I AM glad that they tied it in on The Flash and not Arrow. Arrow has too much on its plate right now with juggling Sara's killer and the Oliver/Felicity of it all to throw a child into the mix. I'm still interested to see if that's ACTUALLY his son or if, by chance, the woman happened to have a kid post-Moira paying her off. ANYWAY, I'm super excited for tonight's part of the crossover! BRING IT ON, FLASH AND ARROW. Excellent to read, as always. *I absolutely love Cisco. I feel he's more than just comic relief and I love how he sees all new things (like the boomerang) and just can't wait to explore and test. I love how he is just in love with his job (and a nice plug for how fun science is). I want to take him home and adopt him and do fun science experiments as a family. Of course, his curiosity and invention can get him into trouble. And I was so feeling his Star Wars quote about jedi at the beginning. I feel ya Cisco. * I love seeing Oliver and Felicity interaction (so married) even if they are currently kinda angsty. They still work together well and still can operate as trusted partners. Even though I am a little bit of an Olicity partisan I just want to see them on screen together because it's beautiful in whatever capacity. And I want more Diggle (I bet on experience too Dig :) and the Arrow ep should deliver on that from what I've heard. Becca: Thanks so much for reading and for your positive comments! 1) I absolutely love the Barry and Oliver dynamic. Oliver seems to be exasperated by Barry a lot of the time and Barry frustrated by Oliver. But it's because, as Oliver noted, they're both extremely stubborn and both want to believe they know best about everything. But what I loved was that, as you said, neither was completely right this episode. And they learned how to genuinely trust one another and support each other and work together. I love that they help each other out, intentionally and nonintentionally, too. 2) YES. We are so used to seeing Oliver as this very brash individual out in the field, but he's calculated (that's his problem with his relationship with Felicity, though -- he overthinks a lot) and precise, where Barry is reckless. Oliver has been in the hero game a lot longer than Barry and has had to learn to NOT be reckless. Unfortunately, Oliver didn't have the luxury of being reckless and not having consequences. We see those quite clearly in seasons 1 and 2 and his flashbacks to the island. I really do think this episode helped me appreciate Oliver's unorthodox methods a lot more. 3) Cisco is absolutely amazing. I seriously just want to have him on my screen all the time. And you're right -- he's not just used for comic relief because he's genuinely SMART and really good at what he does. 5) I'm so mehhhh about Eddie most of the time and that didn't change this episode. I'm pretty mehhh about Iris the majority of the time too. She's cute and seems genuinely good-hearted (and proved last week she can hold her own in a dangerous situation), but I guess I just want MORE from her. And yes, she seemed to do a pretty quick about-face in her faith in The Flash. 6) Ugh, Oliver and Felicity are SO married in this episode. They're seriously becoming the new Jeff/Annie from Community in terms of how many times I say #married (or tweet it, rather) throughout an episode. I loved that she just instinctively knew him and wouldn't sell him out to Harrison (not that I doubted she would). She's protective of him even when he keeps pushing her away because they genuinely do love each other. That final scene was sad, with Oliver looking at her. 7) I feel like Dig is going to be more prominent in the Arrow part of the crossover, from what I heard, so I'm looking forward to it! Thanks again so much for reading. :D I'm so glad you're able to enjoy the episodes more with these reviews. And I can't wait to write about "The Brave and the Bold" tonight!
" I really loved how this episode showed us how thorough and thoughtful Oliver is about how he does his work. He researched Barry's past efforts, noticed strategic errors and tendencies in how Barry works. He is certainly a talented and very trained fighter but I loved what he had to say about discipline, precision, consequences, and learning to be smarter. This gives me great hope that he can continue to learn, that even, in spite of the stubbornness he acknowledged, he wants to grow (which comes from admitting that you are wrong and have more to learn.)" Hmm yes all of this. It's interesting how all of this is clear from Oliver on Arrow (and we've definitely seen where it comes from via the flashbacks) but it's never been so explicitly stated. He really goes into each environment and cases the place, getting used to a new environment. A hard won tactic after being on an island filled with landmines and other dangers. It just highlights the differences in their origins all the more. Again, I can't wait to see what aspects of Barry's origins he will impart on Oliver to teach him a lesson. Welcome, Becca, to the Long Comment Brigade! I think a lot of his scoping of places and people also has to do with how guarded and cautious he is as a person. He mistrusts situations before entering them and mistrusts people so Oliver is very good at calculating risks. He's meticulous about it, actually, and very military-esque in the way he approaches scenarios. Barry is a bit more reckless but I think (in terms of personal life) he feels more freedom that way. I really hope we get some sort of "Oliver, you have to LIVE" speech from Barry in this portion of the crossover. You ladies are the best, by the way. Thanks for commenting! :) Long live Long Comments! Comments like yours and Jenn's blog make thinking about this (and other shows) lots of fun for me. Half the fun is in analysis right? I did my postgrad work in literature so your kind of blogs make me all excited. Maybe this is what Oliver spends all of his time doing now that he doesn't have a day job... training, researching, even reading maybe (Is it weird I have a list of books an imaginary character should read)? But his discipline and reserve (which have been hard won certainly) can really come to hinder him at times (YES Jennifer I totally love that point) as there is no strength which cannot also be a weakness and vice versa. The more covert stuff he is learning in Hong Kong is interesting to see although it's a totally different pace to island stuff. I really hope to see Russia/Bratva flashbacks in season 4 (Give us season 4 CW!) to see what that added to the Oliver we met in season 1. I too can't wait to see the lessons Oliver could learn in the Arrow ep. Time to get schooled in return! I think it's because I worked in a bookstore during and after university that I feel like giving books to people, even fictional ones as long as I feel like I know them. I feel like Oliver would be more of non-fiction kinda guy? He's already done a little quoting of epic Greek poetry season 1. Maybe that's why I want him to read Epictetus or Marcus Aurelius. Perhaps Stoic philosophy would just make Oliver more stoic (haha) but I love those guys and Aurelius was a military leader, emperor and philosopher. And I think Epictetus would speak to Oliver somehow. Can't explain it. For Felicity, I tend to think she would like a mix of techy computer books, science reading, funny fluff and sci fi/fantasy. I would love her to read one of my favourite fantasy series of all time, Fionavar Tapestry by Guy Gavriel Kay. It's epic, full of great characters, real love, tragedy, adventure, sacrifice and beauty. It's made me cry on several occasions and I would want her to love it so we could talk about it. And for some reason I can see her really liking I Capture the Castle by Dodie Smith or Anne of Green Gables by LM Montgomery because they are cool coming-of-age books. Thoughts? Now I'm going to have to think about more characters.